This photograph was captured on a pleasant afternoon back in December of 2007, but it remains one of my favorite engagement portrait images because of the gorgeous light we had to work with, and the couple's perfectly relaxed and natural appearance. The session took place at New Orleans City Park, and this shot is a perfect example of how the typically soft and flattering lighting in the last half hour or so before sunset can help make a beautiful image. The light was pleasantly soft, with just the right amount of directionality. The subtle rimlight gracing the couple's shoulders and arms helps make this image look so visually pleasing. The couple's comfortable and relaxed demeanor was contributed greatly as well. I simply asked them to walk towards me as they held hands and talked, pretending that I wasn't even there, and they did a great job with this as they strolled along and chatted casually. 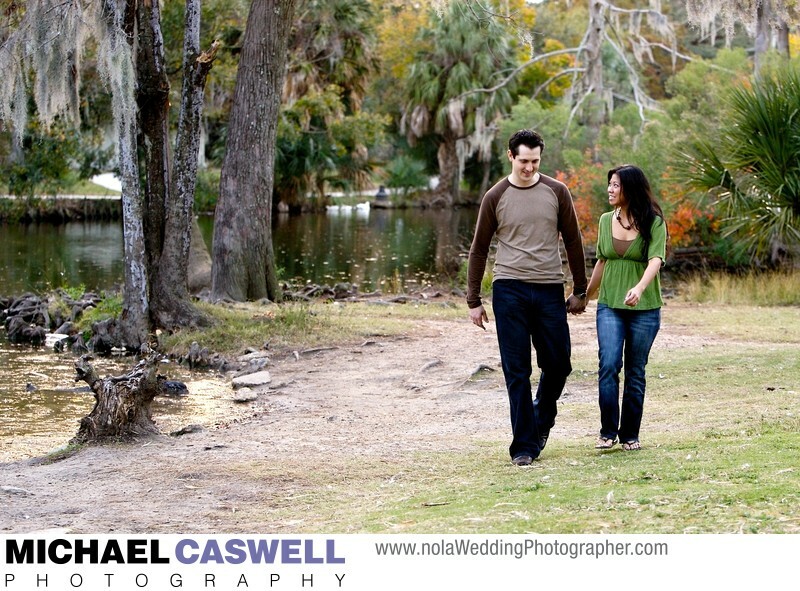 New Orleans City Park is a great location for engagement portraits, as it provides a wide variety of locations, with beautiful natural scenery as seen in this photograph, interesting bridges, and other nice spots to shoot by. The couple particularly liked the moss hanging from the trees and the lagoon in the background, and wanted to incorporate these elements into some of their engagement portrait images. This picture is also a great illustration of how, even in the middle of Winter, engagement portraits in New Orleans are usually easily accommodated, as there are only occasional days when it's so bitterly cold to the point where shooting outside is uncomfortable. Location: City Park, New Orleans, Louisiana.